When you think of storing bulk food, what comes to mind? Do you wonder where you will ever keep it? Do you dismiss the idea because your kitchen storage is already on the small side? Do you envision hefty, 25 lbs bags of grains sitting in your dining room, with no where else to go? Most homes these days aren’t exactly set up for storing food in bulk. I long for the days when every home had some sort of a root cellar or storage room suitable for keeping food for the winter. Buying my whole foods in bulk and storing home grown and canned seasonal produce is key to keeping our food costs low, while still eating high quality, nourishing foods. In order to make buying in bulk a reality, I need to have a place to store it. Time to get creative! What are some of the types of places that bulk food can be stored? This is my recently re-organized pantry. It’s not huge, nor is it a walk-in (my dream pantry! ), but it’s actually amazing just how much I can fit in it when I keep it neat and tidy. I utilize the space very thoroughly, taking into account the height of different containers and jars, and storing things all the way to the very back. If I have something like jars of tomatoes, I can keep them mostly along the back and then a row of them coming up to the front, so that I can just take the front one. I don’t need to see them all. When I have extras of items, I keep them in the back to preserve space up front, and I can dig for them when I really need them. Having a lot of containers does help to keep it tidy and make the storage space well-utilized. I have quite a few older Tupperware containers for dry goods. I also save all of my 1 Gallon honey tubs to reuse. Glass jars are fantastic for storing so many pantry items. Large ziploc bags make it in there when I have nothing else to use. The white basket in the center holds all of my bags of bulk spices, and it contains the chaos that is my spices very well. No, it isn’t the prettiest sight, aesthetically speaking. It’s beautiful to this frugalista, though. The extra foot or two above my kitchen cupboards allows me that space that I need when everywhere else is overflowing. I try to keep it tidy at least by using my 1 Gallon containers, and some other storage containers and bags. I use it mostly for grain and sweetener storage, as well as home canning in the fall when my kitchen is bursting at the seams with harvest goodness. I have on occasion (yes, really truly) heaved an entire 25 lb bag of grain up there when I wasn’t ready to open it. Definitely not so pretty, but it served it’s purpose until I was ready to divy up the grain to smaller containers. Last year we acquired a gorgeous antique bankers filing cabinet. It sits in my living room as a display piece, because I didn’t know what to use all of the itty bitty, and some oddly shaped drawers for. Recently I’ve begun to use them for kitchen storage. They are currently holding all of my bulk herbs. In the summer, when I start dehydrating garden produce like crazy, that’s where my extra bags and jars will go. 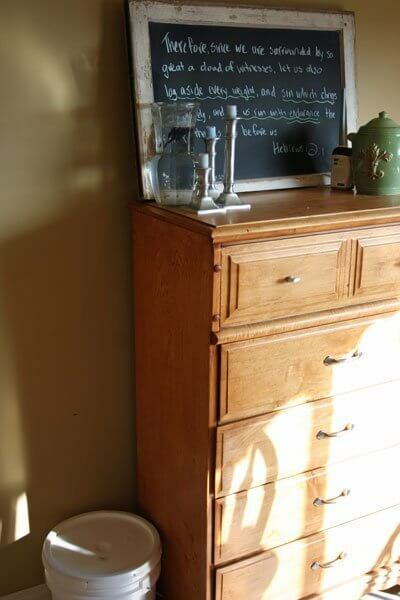 We don’t all have a cabinet full of little drawers, but perhaps you have dressers that aren’t being fully used, empty bathroom cupboards, or some other space that you haven’t known what to do with. When in doubt, fill it with food! 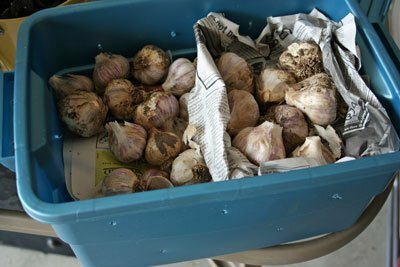 This is the bin of garlic from my garden last summer. I grew enough to last us a full year (including some to plant, and some to giveaway- I grew a lot of garlic!). This bin sits in my garage, where the cool temps help to keep it fresh longer. I have another larger Rubbermaid bin that also sits in my garage. It is full of bags and containers of steel cut organic oats which I buy 25 lbs at a time, as well as Sucanat that I bought in a 50 lb sack (which made it half the price of buying it in smaller amounts). We keep the smaller containers and bags in the large, sturdy bin just to avoid rodent problems and to ensure that the food stayed untouched. I wish I had a picture to show you some of the things I’ve stored in our master bedroom walk-in closet. My favorite was a big tub of spaghetti squash from my garden two years ago. I’ve also stored cases of hemp milk, and some canned goods. No, it’s not a large closet, but I needed space and it did the trick. Many people have far larger closets that we do, and if you keep it wel -organized, that might be a really great place for storing bulk dry goods, like baking items, grains, or canned goods. Obviously not suitable for everything, due to some of the warmth and moisture from the washer and drier, some things can be stored just fine in the laundry room. Canned goods should keep well in a laundry cupboard, unless your laundry room is especially humid for some reason (the lids might rust then). Sealed bags of rice pasta, unopened jars of spaghetti sauce or apple cider vinegar, or bulk honey. There are lots of things that could still work in the laundry room. I think this goes without saying as a perfect place for storing many bulk foods. For more on keeping your freezer well organized, see this post. My 5 gallon tub of coconut oil, that has nowhere else to go. My kids think it’s a fun little stool. It keeps the fish company, while it lives in my dining room. Yet another real and humbling confession from this everyday mama. It’s the only thing I can’t find a place for! 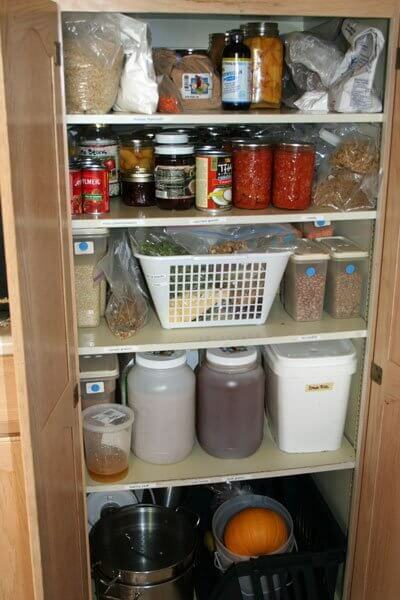 What nooks and crannies of your home do you fill with bulk foods? How do you get around lack of storage space? @Amber, I get a lot of mine from Azure Standard, which I don’t think is in Kentucky. Have you tried doing google searches for natural food coops in Kentucky? Another place to look would be http://www.localharvest.org/. Lots of great resources listed there, all over the US. I am almost ready to start ordering from Azure. I didn’t realize that the pick-up sites were usually people’s houses. I do have one within 30 minutes of me that I am looking further into. I have a question though – I live in Minnesota, where part of the year it can be sub-zero and the other part hot and humid. I live in a small town home with very little storage space and a one-car detached garage. I am wondering what kinds of things I can store in the garage year-round. I am thinking about grains and sweeteners mainly, as those would be what I would be buying in really large bulk quantities. Can things like honey and coconut oil freeze or even get too hot (it might get up in the eighties inside the garage.)? I would assume that grains would be fine. P.S. I was thinking you could throw a scrap of nice fabric over your pail in the dining room and put a knick-knack or some books on top and guests might think you did it on purpose 🙂 My kids wouldn’t leave it like that though! @Sheri, Coconut oil will freeze but it wouldn’t really hurt it, I don’t think. As soon as it got warm again, it would just soften. The honey, however, would start to crystallize. Once that happened, it wouldn’t be as easy to use because it’s not as pourable at that point. Honey is best stored somewhere warmer. What brand of coconut oil do you use? I’m looking to start buying it in bulk, but I’m a little confused by the options. @JoAnne, I buy mine from Mountain Rose Herbs or Glory Bee. I make sure to buy unrefined or virgin coconut oil. This is best for eating. If you just want it for beauty products, then the processed/refined stuff is fine, but not as good for eating. LOL I actually HAVE 2 25lb bags of bulk grains sitting in my dining room right now. Yeah. And no, its not a big dining room! Its simply the fact that I’ve been so busy that I haven’t gotten around to doing what I like to do with them- dividing them into big canning jars (I have tons of those for free) and then storing them on the basement shelves in my laundry room (aka “the pantry” as I do not have a kitchen pantry at all) or put them in the dining room china cabinet along the bottom, if needed. They are out of sight that way. I took out the items that were down there and put them on top of the cupboards. Since our house is open concept its wierd to see the food up there….but I have done that too. I do caution against storing anything in the bathroom though…its a super moist place (even with a good fan) and they even say not to store medicine/vitamins in there. Most of my excess goes in a) the freezers b) the “pantry” shelves. Visualize an unfinished basement, in my laundry room, with those wooden unfinished shelves that you can buy that are just pine nailed together. My husband secured them to the studs on the walls and then they line one wall. Only sealed types of things go there in case of moisture. Right now there is mostly jarred grains, canned tomatoes, and bags of rice pasta, along with a few other items here and there. I learned the hard way not to keep olive oil or salt or sugar down there (unless in plastic or something) as the olive oil hardended on me, and the salt and sugar took on moisture, even though its not really a damp or cold basement at all. Anyways we are blessed with what we have! An abundance of food that we try to figure out where to store. What a blessing that we have so much we have to get creative! Good food for thought! I’d love to hear more about storing in the garage. I tried storing some apples in mine, but they quickly got soft. I’m wondering if the temperature dropped below freezing out there one night. Would that make a difference? I would love it if you could share any tips on storing in the garage as I have plenty of space out there! I reuse containers like your coconut oil container. I use them to store flour, grains, sweetners, etc…. I place two on top of each other and throw a clothe over them and use them as side tables in the living room. I have a larger one my children use a table and smaller ones they use as a stool. They are kept in a corner of their bedroom. I place canned/jarred goods in a rubbermaid tote container under the bed in the bedroom. My bottles of homemade vanilla extract, oils, and mason jars are kept on the shelf in our bedroom closet. I use a 3 drawer rubbermaid storage tower to store dried fruit, pasta, beans, and rice. It is kept beside my fridge. Ah, to have a garage! 🙂 I buy ‘in bulk’ from bulk bins, but not huge amounts. my husband and I couldn’t eat that much stuff before it goes to waste, so for now I just stick with jars in the cupboard, and a few larger bags of things like rice and oatmeal, in the “pantry” (a slightly larger cupboard). 🙂 I’m sure one day, when I have a houseful to feed, I’ll use some of your suggestions! But, I have had to come up with some creative storage solutions, like for our recycling! Eventually it ended up in the bathtub in the spare bathroom (pretty close to our kitchen). Three bins in there, a shower curtain…it’s a great way to use the space! I suggest making a slipcover for the coconut oil container so you can use it as a stool or ottoman and feel stylish as well as frugal! You could even put padding in the top of the cover so it’s even more convincing as a piece of furniture! @Ginger, What a neat idea! I hadn’t thought of that! Where do you buy 5 gallons of coconut oil? Our raw milk comes in glass gallon jars so we’ve been using those, we get 2 gallons a week, so we have a lot of jars. Great post, thanks for your wonderful blog. I just bought Nourishing Traditions, and LOVE it, I can’t put it down! @Jennifer S., I’ve gotten mine from either Mountain Rose Herbs or Glory Bee. Thankfully, I have a pretty large laundry room in my basement, which also serves as a storage room. I have 2 cabinets that were left behind from the previous owners of the home that I use for bulk storage. Even that is not enough room, so I often put things on top of the refrigerator, the garage and any other place I can find that is out of site! I’m a clean/organization freak, so I have to have it out of site or it drives me crazy. .-= Angela Beery´s last blog ..Frugal Tip – Make Your Own Vanilla =-. Where do you buy your honey? I live in Burnaby and am looking for raw honey nearby. Thanks. @Sarah, I actually get my honey from Washington, because I have family there. But there’s a great place in Surrey, on Fraser Highway and 176th. I can’t remember what it’s called, but something simple like “The Honey Bee Store” or something like that. They have great honey and related products, and they sell it in bulk as well. Can I just say that I *LOVE* the chalkboard in your dining room with the verse on it. What a great idea! I love that you can change the verse to something that speaks to you and your family during a certain season of life. And a great way to have a verse in front of you to memorize! Now I need to get myself a chalkboard! I am delighted to see you have organized a pantry that looks as small (and maybe a little smaller) than mine! That means I can do it too! Thank you so much for your inspiration. .-= Angela´s last blog ..Five Top Reasons I Love Homeschooling =-. Hey. Great website, I just love reading your posts! I MUST ask, where did you get that beautiful chalkboard in the picture of your coconut oil? What a wonderful idea, so that you can change out the scripture. I put food wherever I can find a spot. 😉 I store everything I can in the freezer and then general canned items and paper goods on a shelving unit in the laundry room. Buckets of grain are stashed in a corner of the laundry room; home-canned foods are in the hutch cabinet in the dining room. Dried beans are in jars on the baker’s rack. I have a small shelf in the kitchen where I keep other bulk items and baskets for fresh fruit, potatoes and onions. I keep basic baking supplies and dry goods(most in jars) in one of my cabinets. .-= Mary Ann´s last blog ..Menu Plan Monday =-. Perhaps under the bed? Or on top of the fridge? I don’t know about food, but I have been storing my clothes drying rack and a folding table behind our curtains. They are the sheer kind that lets light in still, but hides these items just well enough. .-= Natasha´s last blog ..I’ve been tagged! =-. Great post! Very helpful, thank you! One thing I do is rotate seasonal kitchen items. As soon as it’s too cold for a picnic, I pack up the gear and stash it for the winter. Sure I’ll occasionally use Popsicle trays in January to make a special treat for the kids, but for the rest of the (usually bulky) items, they go in laundry room storage until spring. I love this post, what great ideas!!! And yes, even the coconut oil stash is a great idea. It’s good to know that we are all human, not superhuman, and sometimes all it takes is the admittance of a white bucket next to a dresser. 🙂 Love it. Thanks for sharing your ideas. I don’t have any useful ones of my own, sad to say, I’m still working on getting organized. Working 40 hours a week with an hour and a half on the road each day, plus an hour+ at the gym 3 x/wk while fighting Fibromyalgia has me at a pace where I can just barely keep up, stay sane, and not land on the couch every night for hours. Oh well. 🙁 Maybe someday. .-= Rochelle´s last blog ..Oscar Night =-. We store a lot of our bulk foods under our bed – we make one huge order a year of bulk grains, beans, etc. You can get those bed risers at Walmart, and we’ve always had tons of things stored there. 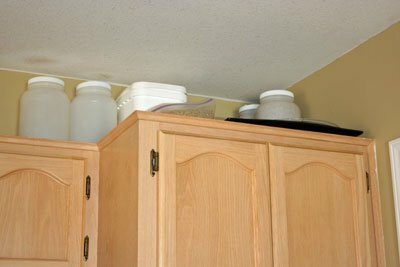 At our old house, I had multiple 5 gallon buckets stacked floor to ceiling by my refrigerator. Believe it or not, our pantry was even smaller than yours! I would love to have that pristine house, but unless I bought everything at Whole Foods (cha ching! ), there’s no way – nope, I’ll settle for a little clutter and money to pay off the house one day :). Thanks for the pics! We bought our first home this past summer and it has a basement! (We live in So. California, so that is kind of a huge deal in this area). It is not a traditional basement like you find back east or in the midwest, and it is unfinished but it is big enough to store stuff. I keep all my extra bulk dry goods, oils, etc down there sealed in mylar bags inside 5 gallon buckets and I keep smaller jars of everything in the kitchen (I discovered Azure, found a drop point, and went a little nuts!). Our kitchen has a butler’s pantry but I have *a lot* of dried goods, so all of my grains, legumes, baking supplies, dried fruit and veggies, etc are on a couple of shelving units we set up (the heavy duty chrome wire type). It does look rather utilitarian, but I store all my stuff in labeled glass mason jars, so it very neat and well-organized. I think you can store things “out in the open” if the area is tidy and looks tied together (i.e. similar and attractive storage containers). Grains and legumes look especially pretty. Creativity and flexibility is key. At our last home I did not have as many things that I bought in bulk, but what I did I stored in the guest room closet, dresser, and under the bed, along with some space in the garage (not my first choice, since it does get so hot in there half the year). All my home-canned food was stored in the guest room as well. We also had a second refrigerator/freezer at that house where I kept all my extra nuts, spices, and flours. Dressers, hutches, and cabinets are my favorite places to hide food storage out in the open and in rooms in which it otherwise looks out of place. .-= Lily´s last blog ..Getting Back in the Groove: The Weekly Menu =-. I recently purchased a large amount of bulk organic grains and am wondering the best way to store them to extend the shelf life. Do you have any suggestions?? I could say that storing more foods in a wide pantry cabinets should not be a big problem, if you know how to organize and simplify things in order. I just wondered if you put the lid on your tub of garlic in the garage or just leave it open??? It looks like you also put layers of newspaper in between your layers. Do you do anything else special for it? That is such a great idea. I had some left over last year–I hung it in onion bags, but it dried out inside. I had to throw it all away–I was heart sick!! I do not like to waste! I am loving your website. It is giving me GREAT ideas! I do put the lid on, but there are holes poked all over the container to make sure the garlic can still get some air and breathe a little. And yes, layers of newspaper to help keep it dry. Other than that, I just make sure that I dry/cure it outside really well first before packing it away like this. It lasts until about April quite well (when the weather starts warming up, I have to bring whatever is left inside or it sprouts/rots). I would love to know where you get your bulk items from so cheaply! I don’t know anyplace that sells these things in big bulk bags/quantities like this for a good price. I always buy the regular size with the big price tag.